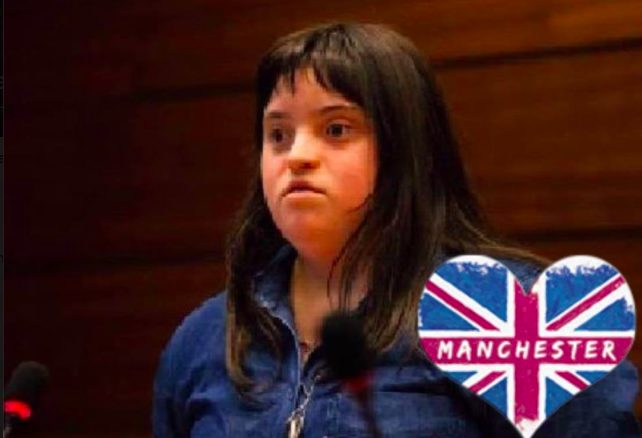 After watching the documentary “A World Without Down Syndrome,” 21-year-old Charlotte Helene Fien, who has Down syndrome and autism, wrote a speech about her right to life that she would later read in front of the United Nations. While babies are still sometimes born with Down syndrome in China, these babies are often neglected, abandoned, left to die, or put in an orphanage by their parents. A British OB-GYN, Dr. Peter McParland, has confirmed that no babies with Down syndrome have been born in Iceland since 2012 and that 90% of these babies are aborted in Britain. Reports show that Denmark is following Iceland’s example, aborting 95-98% of babies with Down syndrome, with the goal of being “Down syndrome free” by 2030. Fien went on to say that while she had Down syndrome, she is not suffering, she is not ill, and none of her friends with Down syndrome is suffering, either. They go to the pub, have boyfriends, and plan for the future. She asks people not to feel sorry for her and says she loves her life. She loves to play golf and wants to teach children to play golf. She travels independently to other countries and doesn’t let Down syndrome hold her back. Doctors told Fien’s parents she wouldn’t walk before age four, but Fien began walking at 15 months. They said she would be in diapers until she was nine, but Fien was out of them earlier than her brothers, who don’t have Down syndrome. According to Bright Vibes, which shared a video of Fien on Facebook, Fien received a five-minute standing ovation for her speech, which marked World Down Syndrome Day 2017.